Looking for interesting composition and lighting is the enjoyable part of photography for almost any professional. There are many types: back lighting, side lighting, front lighting, low light, and dramatic light. When documenting Damali and William’s wedding day in Washington DC, Georgetown, and Northern Virginia, it was the reception that certainly made for some interesting and fun photographs. 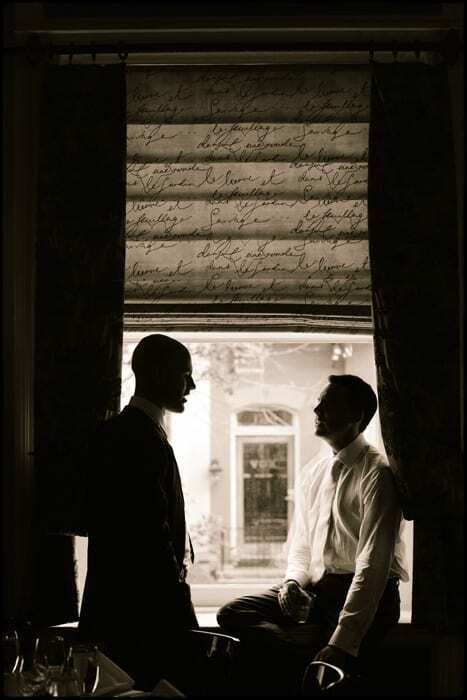 The window light allowed for some back lighting and some minimal side lighting on the grooms face while he was engaged in a private conversation away from the other guests. I was in the room photographing details and looked up and snapped a quick frame or two. They noticed my presence immediately, but it is the shot that shows them engaged in conversation that is most appealing to me. The detail on the window treatments, and the light making its way through the writing, helped frame the two of them nicely.